Editor’s Note: Nearly 600,000 Americans lost their jobs last month, driving unemployment to 7.6%. That’s its highest level since 1992. Overall, some 3.6 million jobs have disappeared since 2008. While a lot of companies are issuing pink-slips, a few are hiring. Here’s one place that’s looking for a lot of workers, but act quickly. 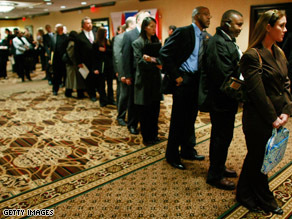 Job seekers stand in line at a job fair in Virginia. Think of this as an enormous help-wanted ad as the U.S. economy flushes thousands of jobs daily. Or think of this as a stimulus program, of a sort. 1.4 million people for part-time work April-June 2009 and same in 2010. Must be U.S. citizen, at least 18-years-old, have a valid Social Security# and pass a background check. Must speak English, but other language skills valued. Work 20-40 hours a week. Most of the jobs are outdoors (need automobile). Pay depends where you are, what you do and what experience you have, but range is roughly $8-$26. In the past, the agency has relied on college students, retirees and stay-at-home moms to fill its ranks, but in the current environment a different mix is possible. Thousands more people than needed have applied for the 3,000 jobs in Michigan, Ohio and West Virginia; states that have suffered a decline in traditional manufacturing jobs. The U.S. Constitution mandates a count be made of the nation’s population every decade and it takes a lot of people to count a lot more people. When the first Census was conducted on August 2, 1790, the population was more than 3.9 million people, including more than 697,000 slaves. The 2000 Census counted more than 281 million Americans. At this writing the U.S. population is ticking toward 306 million. This spring Census workers will verify addresses based on the 2000 Census, removing those out of date and adding new ones. Next year, Census questionnaires will be mailed to those verified addresses. Census workers will knock on the doors of residences that don’t mail back the questionnaire. Start with the $300 billion from taxpayers that is allocated to the states by formulas pegged to Census results. Then consider that the Census also determines which states will gain or lose seats in Congress (translation: power and influence). Census Bureau spokeswoman Shelly Lowe says that three-quarters of the agency’s 12 regions are on target to receive the number of applications they need before hiring. The current economy has expanded the pool of potential applicants. "The economy is a bad thing, there's no question about that," Census office manager George Gutierrez told the Colorado Springs Independent. "But for us, it's a blessing, kind of," a hesitant sentiment echoed from Census offices around the country. What's in the $780 billion stimulus? Editor's Note: This information came from a source in a Republican Senate office that took part in the negotiations. $13.5 BILLION FOR SPECIAL EDUCATION FUNDING - This would bring the federal government closer to the promised 40 percent of the national average per pupil expenditure for every child in special education. This will help relieve the increasing burden at the local level to cover the rising costs of special education, and allow districts the flexibility to retain support staff and teachers in the classrooms where they are so desperately needed. $10.4 BILLION FOR TITLE I– The additional investment in Title I is a critical investment towards children in poverty. As more and more children are classified as poor during this economic downturn, this substantial additional investment will help local school districts ensure that their academic needs are being met. Leading economists have found that targeted aid of this sort will generate increased economic activity of $1.36 for every $1 spent. Moreover, with unemployment up, the number of people who are eligible for Medicaid also rises. Increasing the federal investment in Medicaid will shore up the safety net for those vulnerable families. Evening Buzz: Done Deal On Capitol Hill? 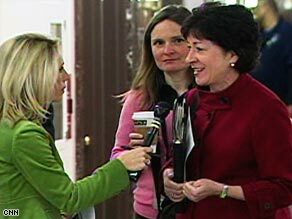 Sen. Susan Collins, R-Maine, right, is one of the senators responsible for Friday's compromise plan. After a long day of negotiations behind closed doors and intense public debate, the Senate has revamped the stimulus plan and could put it to a vote sometime this weekend. 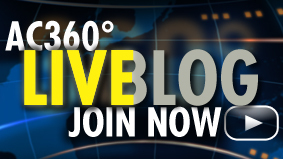 We'll have all the late breaking details from Capitol Hill. The price tag has dropped to $780 billion, down from $900 billion. We'll break down the changes for you tonight. The big question: Do the Dems have at least two Republicans on board to get this bill passed? The Democrats now hold 58 seats in the Senate and need 60 votes to win passage. Senator Ed Kennedy has been absent from Capitol Hill due to his health problems. There's talk of him coming back just to vote on the stimulus bill. What do you think of that maneuver? We also have new details on the mother of the octuplets. We learned today that the California Medical Board is investigating her fertility doctor. Were medical standards violated? 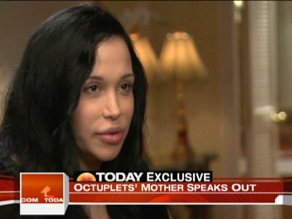 In her NBC interview Octuplet mom Nadya Suleman was irked at getting pounded for being a single mother with fourteen kids. Or in her words, "it's not as controversial because they're couples so its more acceptable." She had good reason to be irked, but she should be irked at herself too for doing much to reinforce that stigma. For the past half century single mothers have been ritually dumped on by everyone from liberal sociologists to Christian fundamentalists and even self-promoting gabber Ann Coulter. They are the fall women for every real and perceived malady in society; poverty, crime, drug use, personal profligacy, welfare dependency, bad acting, and even worse performing students, and of course, family breakdown. As for Coulter, she got hammered for beating up on single mothers in her new book while letting the guys who shove the women into single motherhood skip away scot free. This was more a hit against Coulter than a real defense of single mothers. The perception is just too deeply ingrained that single mothers create babies and problems for a momentary attack on Coulter to change that perception. 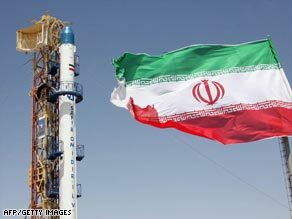 Reported satellite launch took place on the 30th anniversary of the Islamic revolution in Iran. 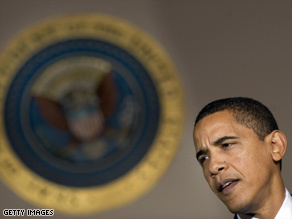 The Obama presidency represents a new era of hope. So here’s my hope: I hope we don’t all get blown up. It’s a hope I tried to keep alive, as I read the news that Iran had fired a satellite into space. Two things struck me about President Obama’s Faith-based office yesterday: this matters to him, and he expects it to get things done. I’ve been asked to serve on the Advisory Council for the Office , and had the honor of being part of a 30 minute Oval Office meeting with the President yesterday. He set out our charge pretty quickly: cooperate to serve others during this time of need in America, and be a positive example of interfaith engagement in a world torn by religious conflict. He spoke about the importance of engaging talented young people, of reaching out to the Muslim world, of working across religious diversity and also the secular / faith divide. The focus isn’t so much what happens in churches, synagogues and mosques – it’s what all those Christians, Jews and Muslims do in the world together. 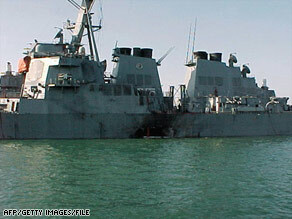 Lorrie Triplett, whose husband Andrew died in the bombing of the USS Cole, said the president met with the group for one hour and discussed his reasoning for closing Guantanamo and explained what would happen. He told the group that they are in the process of reviewing what to do but assured them that “those who need to be detained will stay and those that don’t need to be released,” Triplett said. The President assured the families of Cole victims that Abd al-Rahim al-Nashiri, the alleged Cole bomber being held at Guantanamo, will not be released and that his trial will go forward. Although he told them he couldn’t say yet whether the trials would be military or federal. Restoring New Orleans and the fragile Gulf Coast coastline are priorities of the Obama administration, Kenner-born political strategist Donna Brazile said today, adding that she'll keep pressing President Barack Obama and his staff to ensure they don't forget. 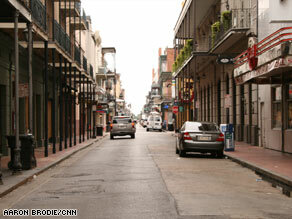 Obama is coming to inspect the damage and recovery, Brazile said at Tulane University, but she doesn't know when yet. "I know that this is a priority for him and the first lady," she said. "I'm going to keep on pressing. . . . I will fight." Speaking to a Newcomb College Institute forum, Brazile said she hopes Obama will discuss storm and coastal relief in his first speech to a joint session of Congress. That address is scheduled for Feb. 24, which happens to be Mardi Gras. The deepening recession has led to an increase in homelessness across the country. Here, in New Jersey, some people find shelter under the porch of a house. Rev. Andy Bales sees an iceberg ahead and fears how much more lies unseen below the surface. "I think it's going to get a lot worse." That iceberg is the surge of homeless people – especially families - seeking shelter nationally and at the Union Rescue Mission in Los Angeles where Bales is CEO. "We have to be creative," he says. That means converting one floor of the Mission for use only by families and buying specially-made tents that give mothers, fathers and children some privacy.